Finance Minister Ngozi Okonjo-Iweala has vowed not to pay the fuel marketers the millions they are requesting while slamming allegations by vice-president elect, Pro. Yemi Osinbajo that President Goodluck Jonathan’s adminstration will be leaving $60 billion debt burden for the in-coming government. 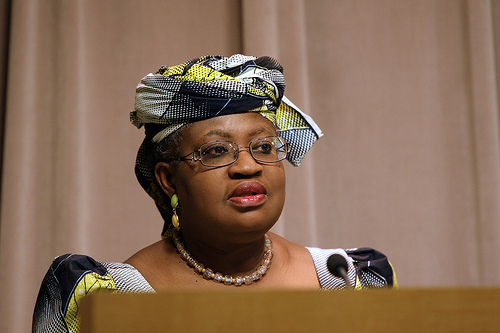 Okonjo-Iweala yesterday said she will not be paying the marketers payment claims to the tune of N159billion in exchange rate differentials because they reeked of fraud. Speaking to reporters at a farewell meeting in Abuja, Okonjo-Iweala said the marketers payment will not be approved unless they were verified by the relevant authorities. According to the Nation, Okonjo-Iweala said, “Marketers were asking for N159 billion for exchange rate differentials from the outstanding N200 billion. There has been so much fraud and scam so I have refused to sign for that money but have agreed that a committee be set up involving the Central Bank of Nigeria (CBN) to verify marketers’ claims. ”Marketers just want to make Nigerians suffer,” she added. The minister urged Nigerians not to take sides with the marketers because they were blackmailing Nigerians. She continued, “I cannot say that the problem is due to not paying marketers, the process of paying marketers is always a rolling process and there has never been a time government reduced its financial obligation to marketers to zero. Though the minster was quick to agree that Nigeria’s total debt indeed stands at $63.7 billion but said it is the totality of all the debts incurred by successive governments since 1960. Her words:“Current debt stock includes both federal and state governments debts made up of $9.7 billion external debt or 15 per cent of total debt stock and $54 billion or 85 per cent domestic debt stock. “The breakdown of the accumulated domestic stock is $18.575 billion outstanding by 2007, $17.3 billion accumulated between 2008 and 2011 and $18 billion accumulated between 2012 and 2015. The minister blamed the government of Musa Yar’Adua for the difficulties to pay debts. She said, “This is so because of something that happened in 2010 because of the salary increment under Yar’Adua administration which increased civil servants salaries by 53 per cent. “Those bonds have been rolled over and government had to weather the difficulties because resources to fund such increase were not there,” she said. Okonjo-Iweala, also speaking on her tenure as finance minster said she has no regrets in serving the country and declared that anyone called upon to serve Nigeria should consider it a privilege. She denied claims that she had mismanaged the economy saying: “The economy is reacting to the forces of demand and supply but there is hope for the country. Only that people will have to make sacrifices. 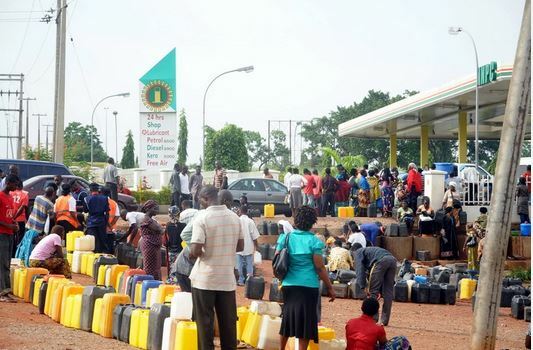 While both outgoing and incoming governments are trying to find out reasons and solutions to the current fuel scarcity, Nigerians have taken to social media to express their concerns about the issue.